Acts 16:14 A certain woman named Lydia, a seller of purple, of the city of Thyatira, one who worshiped God, heard us; whose heart the Lord opened to listen to the things which were spoken by Paul. Revelation 2:24 But to you I say, to the rest who are in Thyatira, as many as don't have this teaching, who don't know what some call'the deep things of Satan,' to you I say, I am not putting any other burden on you. 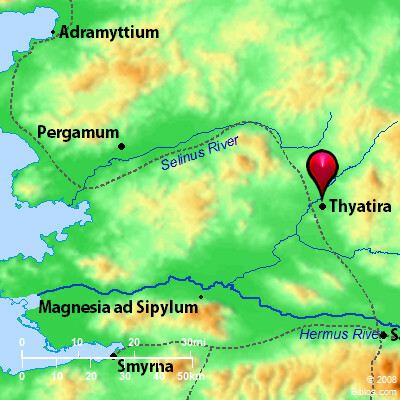 thi-a-ti'-ra (Thuateira): Thyatira was a wealthy town in the northern part of Lydia of the Roman province of Asia, on the river Lycus. It stood so near to the borders of Mysia, that some of the early writers have regarded it as belonging to that country. Its early history is not well known, for until it was refounded by Seleucus Nicator (301-281 B.C.) it was a small, insignificant town. It stood on none of the Greek trade routes, but upon the lesser road between Pergamos and Sardis, and derived its wealth from the Lycus valley in which it rapidly became a commercial center, but never a metropolis. The name "Thyatira" means "the castle of Thya." Other names which it has borne are Pelopia and Semiramis. Before the time of Nicator the place was regarded as a holy city, for there stood the temple of the ancient Lydian sun-god, Tyrimnos; about it games were held in his honor. Upon the early coins of Thyatira this Asiatic god is represented as a horseman, bearing a double-headed battle-ax, similar to those represented on the sculptures of the Hittites. A goddess associated with him was Boreatene, a deity of less importance. Another temple at Thyatira was dedicated to Sambethe, and at this shrine was a prophetess, by some supposed to represent the Jezebel of Revelation 2:20, who uttered the sayings which this deity would impart to the worshippers. Thyatira is now represented by the modern town of Ak-Hissar on a branch line of the Manisa-Soma Railroad, and on the old Roman road 9 hours from Sardis. Ak-Hissar is Turkish for "white castle," and near the modern town may be seen the ruins of the castle from which the name was derived. The village is of considerable size; most of the houses are of mud, but several of the buildings erected by Caracalla are still standing, yet none of them are perfect. In the higher part of the town are the ruins of one of the pagan temples, and in the walls of the houses are broken columns and sarcophagi and inscribed stones. The population of 20,000 is largely Greek and Armenian, yet a few Jews live among them. Before the town is a large marsh, fever-laden, and especially unhealthful in the summer time, formed by the Lycus, which the Turks now call Geurdeuk Chai. The chief modern industry is rug-making. THYATI'RA, a city of Western Asia Minor, about 46 ms. n.e. from Smyrna, now called Ak Hissa, or the white castle, from a white rocky hill where a fortress once stood. It was celebrated from the time of Homer (II. iv. 141) for the dyeing trade. Pop. 15,000 two thirds of which are Christians.